Occult practices have now thoroughly invaded the church in preparation for The Antichrist and his False Prophet to take their place. Christians have been following the world and occult practitioners in bringing certain prayer techniques into what should have been The Holy Place. Certain very clear scriptures have been ignored until now which warn very clearly against these practices. Drawing a comparison between hyper charismatic Christianity and Islamic Sufism, do you know for sure who you are praying to and what spirit is being manifested? How have they targeted our children? What harm has so called Christian TV done to the subject of Bible prophecy? What has Roman Catholic eschatology got to do with it all? 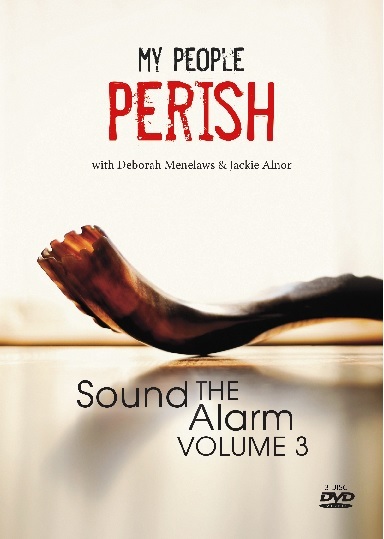 Illustrated with lots of footage and examples, this 3rd and final set in the Sound the Alarm trilogy is an essential for every church, fellowship, seminary and Bible School. Every Christian who is serious about walking with The Lord Jesus Christ NEEDS to know this stuff. Deborah Menelaws and Jackie Alnor are researchers, broadcasters and authors who have a knowledge of ancient and modern world religions, contemporary cults, paganism and the occult. Deborah examines several practices in the modern church in the light of The Holy Bible and her own experience within the occult and Eastern mysticism before becoming a Christian whilst Jackie shares her years of expertise in critiquing Christian television and the Roman Catholic system. Should you open your 3rd eye and what does God say about it? You might be surprised! A look at the Great Invocation outwith the church and entering an Altered State of Consciousness within. Some horrifying footage of children being taught occult practices on TV. Building the tower of Babel, coming together in One-ness is something that God sees as threatening to life on planet Earth. What are the spiritual implications and why? Bringing together the previous 2 seminars, we now see how the subtle 2 prong attack within Christendom is duplicated in The World as both Beasts of Revelation (known as The Antichrist and The False Prophet) have their paths prepared for them. From so called apocalyptic films to date setting, the false promises of false preachers have led to people not believing Bible prophecy anymore. How and why it all went wrong – from TBN to God TV, the links with Roman Catholicism and what does The Vatican really feel about Pope Francis?